This was the first time I have ever made acorn squash. Spaghetti squash, sure! Acorn squash, who? 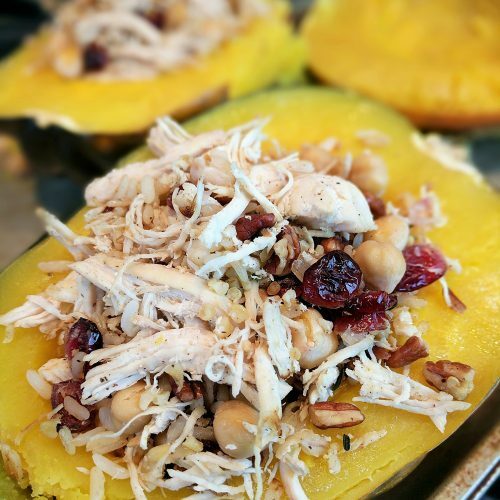 This chicken & cranberry stuffed acorn squash is filling and just what the doctor ordered this fall. I adapted this recipe from Well Plated! I was looking for some new fall inspiration and this fit the bill! I added chicken, balsamic vinegar and ixnayed the mushrooms. However if you are vegetarian you can either follow the original recipe by clicking here OR I suggest following my recipe below and use quinoa instead of rice (get that protein brah! ), leave out the chicken and add mushrooms to the sauteed mix. If you are gluten- free then you are in luck! You don’t have to change a thing! Each squash half has 388 calories, 7.5g fat, 58g carbs and 25g protein. This is low cal, low fat but a little higher carb. The carbs come mainly from the acorn squash and I think the benefits of this vegetable outweigh the carb content. Click here to read about the benefits of Acorn Squash. Acorn squash is not the easiest to cut when raw, so you better hit the gym before making this recipe LOL. It takes a good knife (click here to view/buy the ones I have) and a little gumption! I believe that you can do it though! 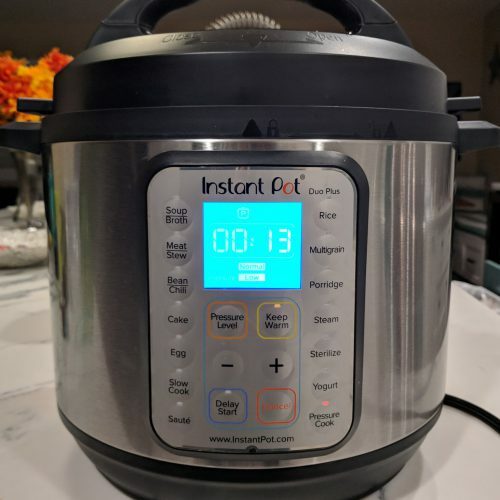 I made everything in the Instant pot (click here to view/buy the one I have) and it took about 50 minutes total. Please note that a lot of that time is not active time because you are waiting for the Instant Pot to come to temp. Feel free to carry on with your other business while this is cooking. Another option is to use rotisserie chicken instead and skip steps 1 & 2 below. This will take off at least 25 minutes, however rotisserie chicken isn’t as healthy as the organic chicken breasts I suggest below. I bought my acorn squash at Trader Joe’s for 1.99 each! SCORE! The regular market will charge you by the pound and that adds up quickly! 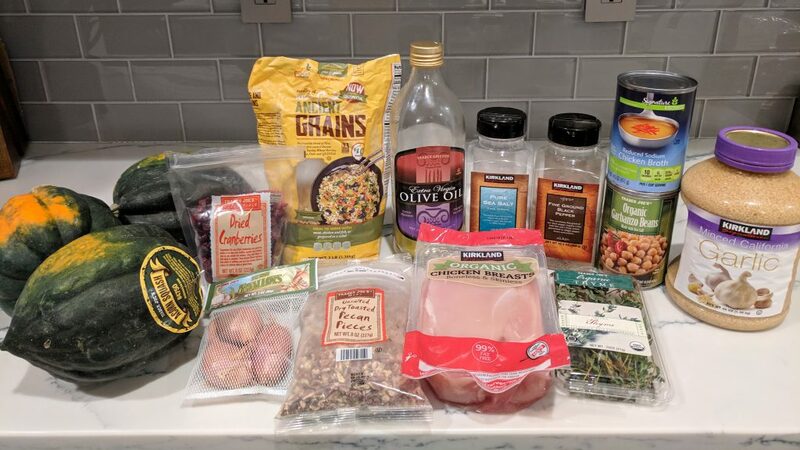 I also buy my shallots, garbanzo beans, cranberries, pecans, chicken, thyme, quinoa, balsamic vinegar & olive oil there as well! Trader Joe’s doesn’t always have everything you need, but in this case, they have it all! Hope you enjoy this unique dish as much as we did! 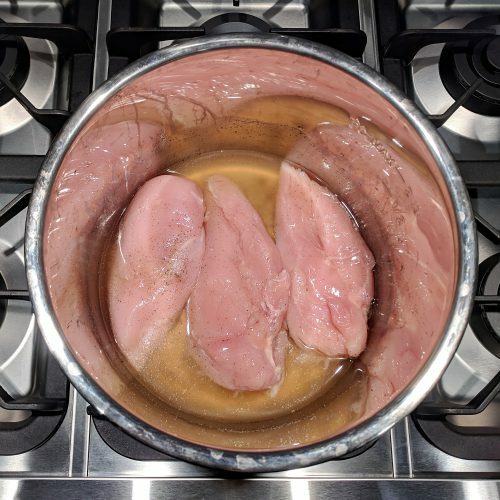 place chicken breasts in Instant Pot and cover with 6.5 oz chicken broth, 1/4 tsp salt and 1/4 tsp pepper. Stir to mix. 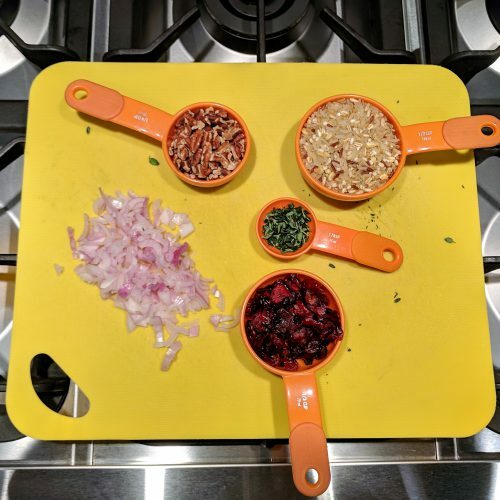 while chicken is cooking, slice & clean squash, chop shallots & thyme, measure out pecans, cranberries and rice and drain beans. while squash is cooking, cook rice according to package instructions. I used the remaining chicken broth to cook mine. 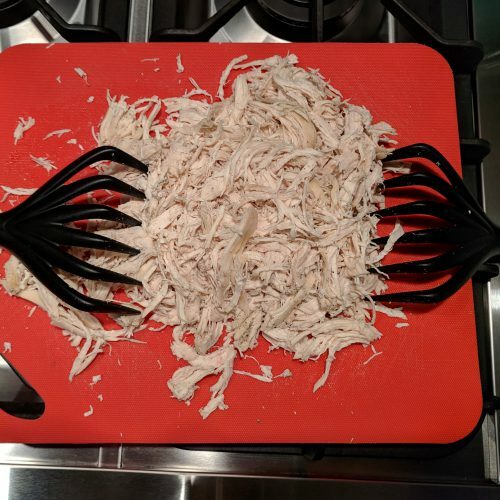 Shred chicken using two forks or shredding claws. when rice is done, heat a large skillet over medium heat. add olive oil for 30 seconds. add garlic for another 30 seconds. 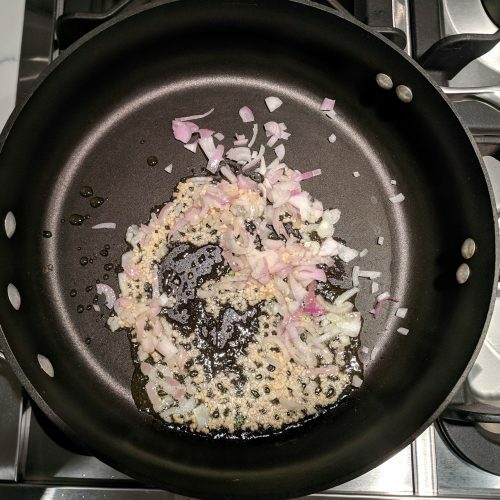 add shallots and saute for 2 minutes or until translucent. 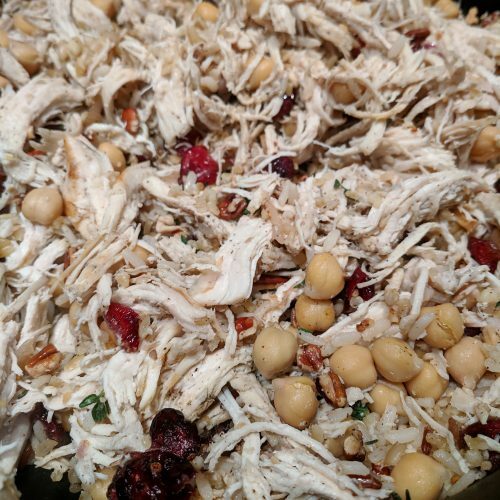 add shredded chicken, cranberries, garbanzo beans, pecans, rice, thyme, 1/2 tsp salt and 1/4 tsp pepper. heat for about 3 minutes stirring occassionally until everything is heated through. Add balsamic vinegar halfway through. 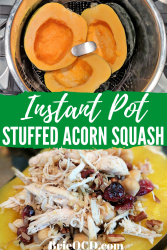 carefully remove squash from Instant Pot. 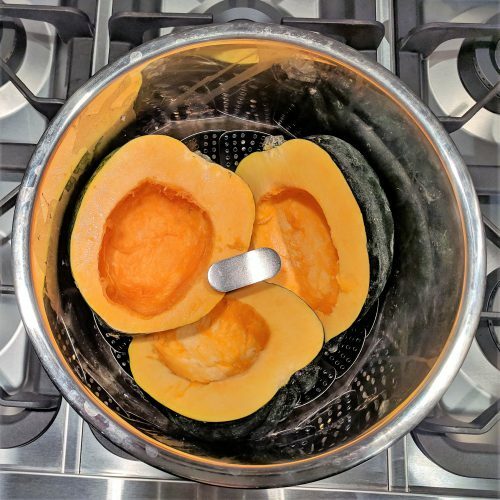 drain any juice from the squash halves. Scoop chicken mixture in the squash halves and enjoy!